Inspiration to Leadership, Lessons from Life, School/Higher Education, Parental Counseling, IT, Student Counseling. Holistic learning, also known as global learning, is a learning style based on the principle that students will learn more effectively when all aspects of a person--mind, body and spirit--are involved in the experience. When knowledge of the real-life phenomena is divided in to subjects with narrowly defined boundaries, and when each subject is decomposed into simpler and simpler concepts, the connection of a simple concept to the real-life phenomenon becomes less and less visible. The emphasis of the teacher on concepts whose connection to the real life phenomenon has been broken becomes senseless to a student. Thus, pages over pages of exercises of sums of three digit numbers and extraction of square roots no longer makes any sense to the child. Being subjected to such senseless exercises day after day turns off the student and he begins to hate the process of learning itself. Exploration of real-life phenomenon is always interesting, full of mystery, surprises and the discoveries so made are exhilarating. By dividing such a knowledge into subjects and then down to their senseless first principles, we rob the knowledge from such adventure, make the process tedious and boring. No wonder we have to force, cajole, bribe, threaten, humiliate the child in order to coax him in to doing some thing which holds no mystery and discovery and sense for him. Is there electronics? Of course yes. Is there mathematics? Yes, of course, the intricate manufacturing and fitting of the electronic components and their design was not possible without the mathematics. Is there sociology? Yes, the way we communicate, interact, meet, talk, socialize. Is there language? Of course how can you use it without the language, send text messages, read messages, emails, tag videos, store information, exchange information etc. Is there physics? Of course, the screen, casing, current, etc. Is there chemistry? Of course, the materials with which it is made could not have been manufactured without the knowledge of chemistry. 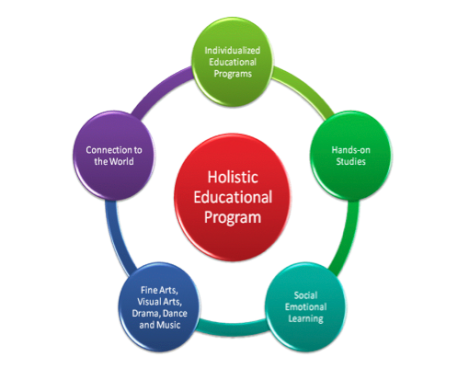 Holistic education is mainly characterized by its focus on fostering learning by relating to subjects on a personal level and by its emphasis on interrelating subjects and concepts. The holistic method strives to mimic the way the brain learns information naturally; that is, with related bits of all subjects--history, science, literature--connected together. Subjects are not learned separately, but rather in relation to one another and in relation to what the student already knows. Concepts are studied from many different perspectives and rote memorization is strongly de-emphasized. By contrast, traditional educational methods keep subjects strictly separate, with subjects and concepts compartmentalized and few connections made between them. Concepts are generally presented from one perspective and learning depends heavily on repetition and memorization. Objective of holistic learning is to make the student focus on the big picture and through a process of exploration and discovery using the student's natural curiosity move downwards to reach to the principles through a top-down process. This is entirely different from the classical composition of text books that typically move from simple to complex. Text books typically subscribe to the narrow subject boundaries. This is but natural. As the text books are written by experts whose take is not a learner's view of the subject but actually an expert's view of the subject. Expert looks at the field bottom up because he is an expert and in the process can foresee the connections that a concepts is going to establish with other concepts as the concepts become increasingly more and more complex. However, for a learner this view is not only unnatural but also senseless as he is just starting out and can not look at all the possibilities with which connections would be made by other concepts within the subject boundary and with other concepts in related subjects to eventually make real-life objects that are interesting, useful and studying whom makes sense. We teach the students things that do not make sense and expect them to piece them together and derive the sense through a process of composition. Children often find it difficult to wait for some thing. The wait especially becomes tedious and more and more distant for abstract concepts that are not making sense, and therefore they lose hope and turn away from the learning process itself. Aah ko chaheeyay ik umr asar hone takKaun jeeta hay teray zulf k ser honay tak. very simple parts and only then make the education process of a child start from those simple (but yet totally senseless) concepts. This is akin to having our food divided into components such as proteins, fat, carbohydrates, vitamins etc and each one placed on our plate in small piles. We are then asked not only to eat such tasteless piles and then expect our digestive system to digest them is not practical. Note that our digestive system is designed to decompose the whole food in to the constituent parts. It is not designed to digest concentrated dozes of fat, carbohydrates and other parts of food. Similarly, our minds have been designed to decompose complex phenomenon into simpler parts, solve mysteries, explore unknown territories. We are fascinated by riddles, UFOs, fairy tales, horror stories. They do not turn us off, but actually pique our interest and engage our interest. Similarly, real life phenomenon pique our interest. A child does not know how a toy car works, and in his curiosity will break it to find out how it works. Similarly, he would like to explore every closed (especially) locked windows, to see what is on the other side. We need to make our subjects alive, thrilling, full of wonder, inviting, engaging and enthralling. This can only be done through holistic learning. Thus, our curriculum should be holistic. It should be designed to engage the students, hold their attention, move them away from interesting video games, engaging facebook, and riveting programs and movies. Education as Tazkia: Is a child like a clean slate? Why Educational Experiments are "Doomed" to Succeed? Can Grades and Degrees Measure the Success of Students?